We’ve heard it all our lives -- breakfast is the most important meal of the day! But if the idea of cooking before your kids have to catch the bus seems to daunting, we have some quick and easy options for you that are also nutritious. Here are 3 recipes that are kid-friendly and healthy. Our quick-and-easy breakfast quest begins at Toast in Birmingham with a recipe from Executive Chef Chris Gadulka. “I picked Mueslix because it’s a fast, easy dish that’s really healthy that still has the sweetness that kids love but has all of the healthy benefits that parents like,” said Chef Gadulka. Mueslix ingredients include your favorite granola and his make-ahead Lemon Crema that you can store in the refrigerator for numerous servings (see recipe below). Just add the Lemon Crema to your granola and garnish with fruit. Since Greek yogurt is the main ingredient in the Lemon Crema, this recipe provides a good mix of fat, protein, and fiber that is filling and healthy. 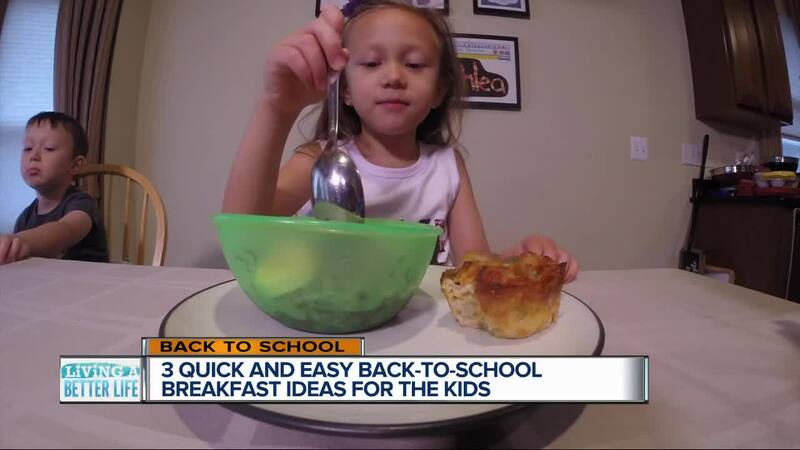 Grace Derocha – a Registered Dietician with Blue Cross Blue Shield of Michigan – says a healthy breakfast is key for kids. “You want them to have something that’s pretty nutrient dense so they do have some good brain power for the day,” said Derocha. Her Slow Cooker Oatmeal with Quinoa is a set-it-and-forget-it favorite in her house. “I usually get it ready the night before, and it actually cooks while we’re sleeping. So, in the morning, it’s done,” she explained (see recipe below). “Think of how you can add fruits or vegetables to that breakfast meal to squeeze them in because kids aren’t getting enough,” Derocha said, talking about her inspiration for this muffin recipe. You can use most any left overs in the fridge. But turkey and cheese with veggies is one of her kids’ favorites. The time-saver in this recipe is to buy pre-cut frozen or fresh vegetables and frozen cubed hash browns. If you make the muffins on the weekend, you can store them in the refrigerator or freezer. Then, you just pop them in the microwave to heat when you’re ready to serve breakfast to the kids. The recipe makes a dozen muffins, but you could easily double the recipe to make more (see recipe below). This is a great twist on a breakfast bowl incorporating a creamy lemon mixture you can make ahead of time and keep in the fridge. Lemon Zest - 5 T. + 1 t.
Combine all ingredients, stir, and store in refrigerator until needed for Mueslix. In a large bowl combine the granola and lemon crema, folding well. Garnish with the bananas, apples, and berries. Enjoy! Makes 2 servings. Spray a 6-qt. slow cooker with cooking spray or use a slow cooker liner. Add in all the ingredients (except optional ingredients for garnish) and stir until combined. Place the lid on tightly and set the slow cooker to cook for 5 hours on low and then let it sit for another hour on warm. Give the oatmeal a couple of stirs. Serve hot and garnish. Enjoy! Preheat the oven to 375 F degrees. Spray a 12-cup muffin pan with cooking spray. Heat the olive oil in a large skillet or pot over medium heat. Add the onion and cook for about 2 minutes until it starts to soften. Add the turkey and cook for another minute until the turkey heats through. Let sit for about 5 minutes to cool. In a smaller bowl whisk the eggs, milk, and hot sauce (optional) together. Pour this mixture over the turkey mixture. Add the shredded cheese and stir everything together. Using an ice cream scoop fill each muffin tin with the egg and turkey mixture to the top. You should have enough for 12 muffins. Place the muffin pan in the preheated oven and bake for 25-to-30 minutes or until set and the muffins start to get golden on the top. Let the muffins cool for a couple minutes and serve warm. You can refrigerate for 3-5 days or freeze! Always warm through before serving. Enjoy! If you have a quick-and-easy recipe kids will love, please share in the comment section below or on our facebook post. Thanks!